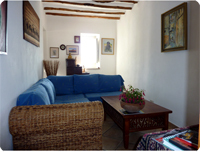 Fully Furnished Traditional Aeolian house of 290 sq.m built around a central courtyard with original style cistern. 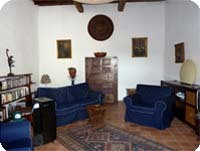 Recently completely renovated as a single house but with potential as a bed and breakfast. With very little additional work it would be easily divisible to create 1 monolocale with its own entrance, 2 apartments and a separate self-contained house. Sympathetically restored with traditional materials and timber features, incorporating fully fitted kitchen with marble worktop and Aeolian wood oven with large separate dining area and adjoining small sitting room/snug. Off the main courtyard is a large sitting room with thermo fireplace, 5 bedrooms (1 on first floor level), 4 bathrooms, laundry room with W.C. and shower, small boxroom, store and further kitchen. A large wall terraced fully fenced garden with fruit trees and plants descends the valley. 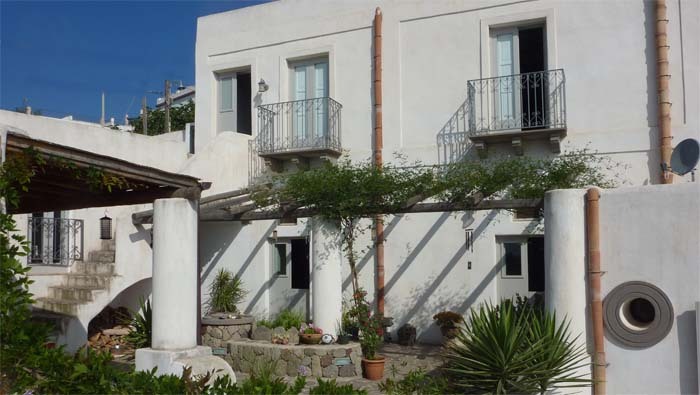 There are far reaching views down to Lipari and the sea, as well as to Sicily and Calabria, a parking area for up to 4/5 cars with electronic gate and intercom and a second entrance leading to the lower terrace where there is a further cistern.